It's here! One of my favorite weeks in summer! Why is it that we are so drawn to these amazing creatures? I mean...they're a little bit scary terrifying....& yet we're drawn to watch them. It's true, though...right? And here's the thing....if adults are fascinated by sharks, just imagine how fascinated kids are! 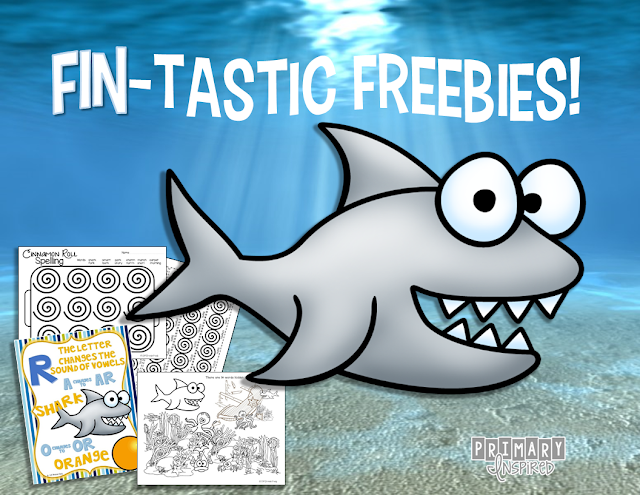 I'm always excited to check out the shark-themed resources during this blog hop Luckeyfrog's Lilypad & Digital: Divide & Conquer host because I know how much my kiddos love shark anything. I Spy activity page where kiddos have to use magnifying lenses to find & then sort ar & or words on the recording sheet. Just click the pic to download from my dropbox! Keep on swimming! Your next stop is over at Teach123. Enjoy!